There is something within each of us that is self-protecting response that resists vulnerability and dependency. I most certainly think it is a learned behavior that increases with age and maturity. The worse parts come from our sinful nature. But it is a normal piece of development to grow to be independent is learn to do for ourselves. It’s a natural process that all of us experience personally and then as parents, we get to go through again, but this time from the other end of the spectrum. In some ways, it is fun to watch your children grow into independence (although it always seems to be happening too quickly)! And we already have one who is incredible dependent as a 5 month old, but I can say we weren’t totally prepared for what it would look like to add another dependent child, with Cole our 5 year old. At times, we have two who need us at the exact same time! In nearly every way Cole is dependent and has to receive from others. From moving from the couch to his wheelchair, being fed or having to use the restroom, he finds himself in a state of continually having to receive and not do. 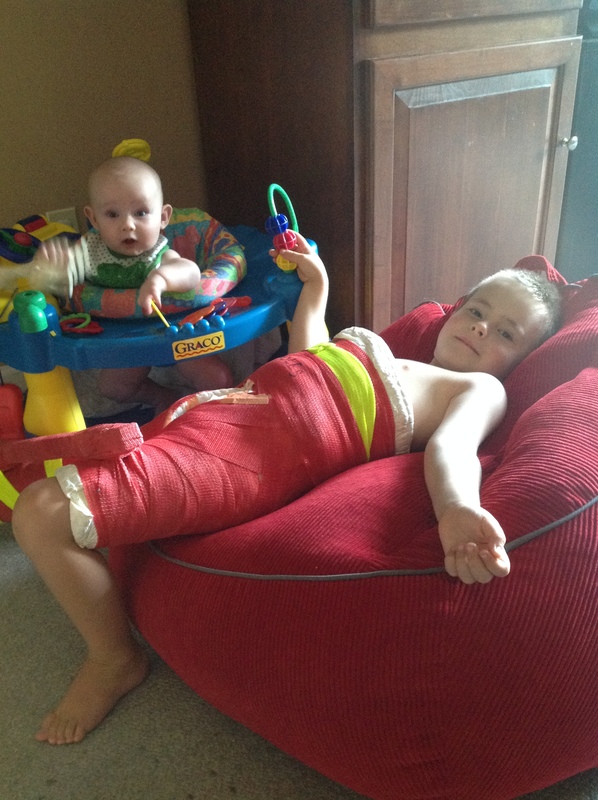 Although, he has become increasingly mobile – he can turn from side to side and also has learned to flip onto his stomach in his cast, he still has to receive help to move. He will scoot on his stomach, but that only gets him so far. But once he is in his wheelchair, he has become very good at maneuvering. And if we aren’t looking, he will try to slide off the couch and stand in his cast, but this is a big no-no! All in all, Cole is progressing really nicely. He seems to rarely be in pain, so he’s taking his medication on an as needed basis. He’s sleeping better during the night, but that still is the toughest time for him. He’s having a blast with his brothers and the friends that have been coming by to see him and to play. We try to get outside when it cools off to enjoy some fresh air and the outdoors. He had a blast celebrating the fourth of July and was a big fan of our fireworks show. It’s hard to believe that he has been in his cast for 19 days… but each day gets us closer to our next x-ray and the final word on when the cast comes off. Even though he is doing well, at 5 years old, his current condition puts him in a more similar place that his 5-month old brother is in. He’s had to give up his independence and “I can do this for myself” and has had to learn to receive. He’s dependent on us for most everything, but he has been such a great receiver, with such a great attitude that I find I’m learning from him on this journey. Most of my life, I’ve found myself in the role of giver, not receiver. Whether as a parent or especially in ministry – my life has been more marked by giving than receiving. And honestly, I like it that way. But that’s where God has been gracious to allow me on this journey to learn, alongside Cole, how to receive better. I know the calling of the body of Christ to all the “one anothers” – love one another, serve one another, bear one another’s burdens, encourage one another… and the list goes on. Some 56 times we are given these “one another” commands. And while they are easy for me to preach and also practice, I’ve found it surprisingly challenging to be on the receiving end of them. Even knowing the importance of 1 Corinthians 12:25-26 that, “This makes for harmony among the members, so that all the members care for each other. If one part suffers, all the parts suffer with it, and if one part is honored, all the parts are glad.” This paints such a great picture of what it means to live in community – the community of faith. When one of us hurts, we all hurt. When one has need, we respond to that need. And that is why we are so grateful to the continued outpouring of love, meeting needs and support – especially from our faith family at Wildwood now that we are back in Tallahassee. For the meals, gifts, cards, visits – we are certainly humbled and thankful. And I can say that God is teaching me how to better learn to receive. It definitely doesn’t come naturally, but God is good to teach me how to receive from others. So many of you practice Hebrews 13:6, “Do not neglect to do good and to share what you have, for such sacrifices are pleasing to God.” And because of your generosity and love, we can affirm Philippians 4:19, “And my God will supply every need of yours according to his riches in glory in Christ Jesus.” So thank you, not only for your giving, but for helping us in our faith journey by learning how to receive!